This week’s recipe comes from the wonderful new Meat Free Monday Cookbook. The book was produced by Sir Paul, Stella and Mary McCartney in support of their Meat Free Monday campaign which encourages everyone to go meat free at least one day a week. The cookbook includes some fabulous recipes to help you reduce your meat consumption for your health and the health of the planet. You might also want to check out our competition to win one of 5 copies of the book. This recipe makes use of wholewheat couscous which is nuttier and that little bit more nutritious than the white, bran-free variety. It complements sweet potato perfectly and vice versa. This is a typical North African dish; za’tar is a spice mix used extensively in the region’s cookery. 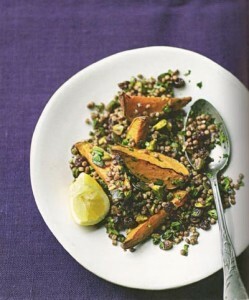 This recipe by Stella McCartney makes a delicious lunch or light dinner and will serve 4. 2 Scrub the sweet potatoes under cold water and cut each into 6 wedges. 3 Tip into a roasting tin, drizzle with 2 tablespoons of olive oil, season with salt and freshly ground black pepper, and roast in the oven for about 20-25 minutes or until the sweet potato is tender and starting to caramelise at the edges. 4 Add the pumpkin seeds to the pan for the last 5 minutes of cooking time. 5 While the sweet potato is cooking prepare the couscous. Heat 2 tablespoons olive oil in a large sauté pan, add the couscous and cook gently for 2-3 minutes until starting to brown. 6 Add half of the stock or water to the pan and continue to cook for about 15 minutes, stirring frequently until the couscous is tender and has absorbed the liquid. Add the remaining stock or water to the pan as and when needed. 7 Add the raisins, za’tar and chopped pistachios to the pan, season with salt and freshly ground black pepper and cool slightly. 8 Mix together the juice from half the lemon and the extra virgin olive oil and pour over the warm sweet potato when it comes out of the oven. Gently stir the freshly chopped herbs and roasted sweet potato wedges into the couscous and serve with extra lemon wedges for squeezing over. © Recipe copyright the Meat Free Monday Campaign – no reproduction without permission.